Revisiting Oil Cleansing and a Fabulous Give Away! Remember way back in February of last year when I wrote about oil cleansing? Remember how much I loved it at the time? Ah, but now. Now, my friends, I have found a better way and my skin is loving it! First of all, let me back up and explain why I left oil cleansing behind and went through an angstful period of trying different natural soaps and creams that never quite did what I wanted. Quite honestly, the oil cleansing became too fiddly. I didn’t love what the castor oil did to my skin. I always felt either too dried out or too oily. I didn’t love that I had to steam my face all the darn time with kids climbing over me and jumping into the middle of my stomach while I was laying flat on my back. What started out like a pampering facial every day eventually became anything but. Sometimes my skin would feel rough and I would try to exfoliate with baking soda (too irritating) or ground flax (too scratchy) or oatmeal powder (too goopy). I just could never get the right balance. I had it. For one brief and shining moment I had it, but I never could get it back and the whole thing just got really annoying. And don’t get me started on stinky wash cloths! The oil would go rancid and the whole laundry would smell. So then I went back to washing with soaps and my skin went back to looking tired and I thought it was all over with. Then I remembered my friend Elizabeth. Elizabeth is a master aromatherapist who helped me immensely in getting through the trauma of leaving Cricket to go back to work. She worked with me to find the right essential oils to help balance my mood, help me with my grief (because I really did go through the 5 stages of grief), and to help stay focused at work when all I could think about was getting back to my little nursling. Elizabeth owns a company called Lux Amare. She sources all of her essential oils herself (no mid-level marketing here), and she has an unbelievable passion for helping mothers and babies. She does all the blending and creating herself. Right in her home. No factories. The amount of research she puts into her ingredients is astounding. Every single one of her products is made with absolutely the best ingredients available. So I was really excited when I found her Luxury Skin Care Oil. I got a bottle and started using it. Initially, I was using it in the same way I used my old oils. I’d smear it on, walk around for a while, steam it off with a hot wash cloth, and wipe the rest off my face. It was good. I liked it. Then Elizabeth and her daughter made a how-to video on youtube. When I started following the instructions on the video, I realized that the Luxury Skin Care Oil wasn’t just good. It was amazing and I loved it! My skin was radiant, fresh, and it never got that rough feeling like I needed to scrub it. Since then, I’ve kept up with using the Luxury oil, and it’s been fantastic. No more rough, tired skin. No more stinky wash cloths from the castor oil going rancid. No more stripping old oil out of wash cloths with dawn and boiling water. The Luxury Skin Care Oil washes out cleanly with the normal laundry. The other really cool thing about the Luxury Skin Care Oil is that it’s not just for washing your face. I love things that do more than one job. Believe me, having worked at a high end cosmetics counter in my youth and using a 14 step skin care routine in the past, I am all about simple. The Luxury Skin Care Oil works both as cleanser and moisturizer. It also can be used as a bath oil, a shaving oil, an eye makeup remover, an oil for your hair (I rub the excess into my hair every night! ), and it will even get rid of head lice in children safely and without the use of dangerous chemicals. So basically, it’s pretty awesome stuff. With the start of the Midwest winter, my skin started to freak out a little bit. I called Elizabeth, and she recommended adding in her Pumpkin Jasmine Serum, which is part of her basic skin care line, although basic hardly describes this stuff. It smells and feels like bottled luxury. It’s really helped get me through fall without being too heavy. And as winter progresses, I may switch over to the Acute Derma Soothe which is an ultra-rich, healing cream. This is skin care I can handle. It’s simple. It works beautifully. It fits with my busy lifestyle. It leaves me feeling good about myself. 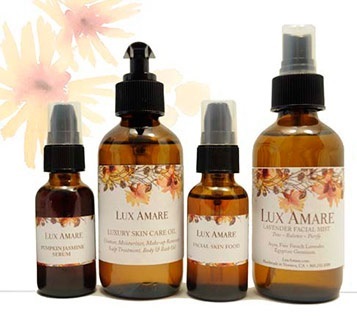 Lux Amare Skincare is simple, easy to use, and leaves me feeling beautiful. I spent a lot of time talking about the Lux Amare skin care, but that’s only a piece of what Elizabeth does. Her Mama & Baby line is to die for. If you are ever unsure what to give someone for a baby shower gift, look no further! My personal favorite is the Chamomile Baby Rub (you will never, ever find chamomile like this! Believe me, I looked! ), and the Fine French Lavender is some of the very best lavender you can buy. Both are fantastic for fussy, gassy nights. Now I know up in the title I said something about a give away. Why yes! We are doing a give away! You can enter for your chance to win your very own bottle of Luxury Skin Care Oil. We’re going into a stressful time of year, so it is a good time to remember to do some self-care. We have to make sure our own cups are filled so that we can keep refilling everyone else’s. To enter, please follow the link below to go to the Rafflecopter widget. Good luck! This giveaway will end at midnight on Wednesday, December 11! This was a paid review. I received compensation from Ashli McCall’s publicist for this post. All opinions are my own. 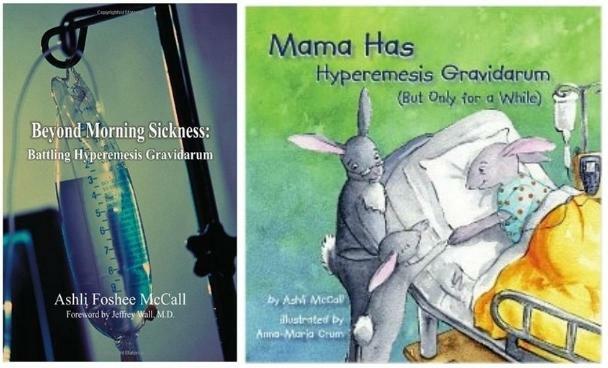 Over Christmas break, I contacted Ashli McCall, the author of Beyond Morning Sickness, which is The Book on HG, and Mama Has Hyperemesis Gravidarum (But Only For A While), a children’s book. Her publicist was kind enough to send me copies of these books for free. He also included a printed copy of the journal she kept during her fourth pregnancy with her daughter, Elise. I started with Ashli’s journal. I wanted to learn more about Ashli. 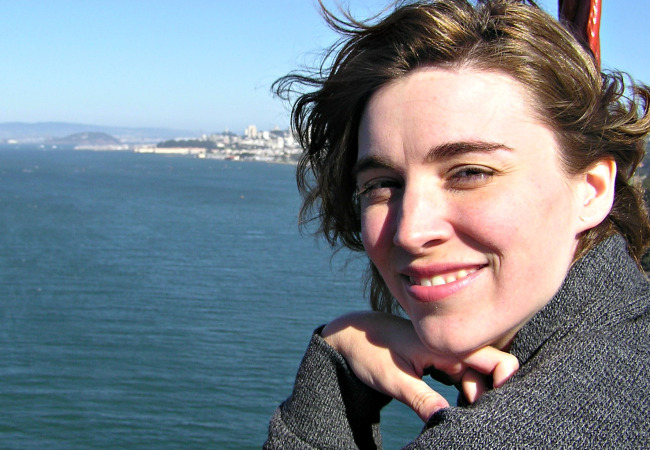 I wanted to know what she’d been through, and I wanted to find out what prompted her to write her books. This journal was absolutely riveting. And terrifying. Ashli went through absolute hell to bring her daughter into the world. This was a brutal read. Her loss, her pain, her grief, and ultimately her joy just made me ache. Ultimately, though, it was inspiring. Her strength is incredible. It’s easy to call her a hero. Here is a link to the online version of her journal. Like most blogs, you’ll have to go way back to get to the beginning. Again, let me say this: Her diary is a raw and difficult read. This may act as pretty effective birth control if you’re considering another HG pregnancy. Pick your timing on this one. There are several things she discusses that might be triggers for some people, so please be aware that she discusses loss of a pregnancy, termination, severe HG, and severe, severe illness. She also talks in-depth about her faith, which sustained her throughout the pregnancy. 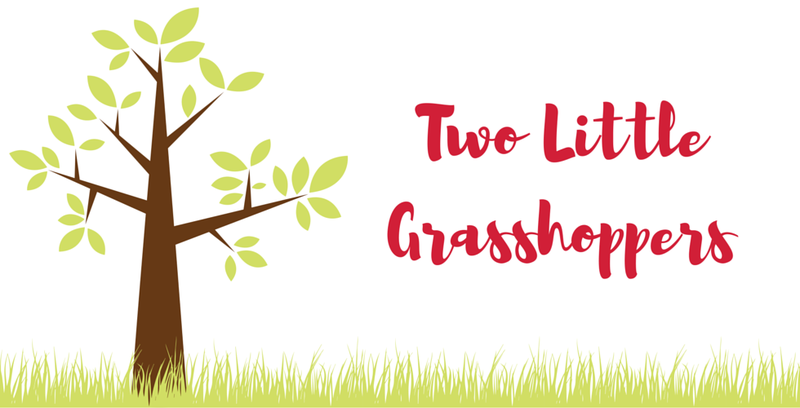 This Saturday, I also read Mama Has Hyperemesis Gravidarum (But Only For A While) to the Grasshopper. I hadn’t planned to read it to her yet, but after much pleading (it has bunnies on it), I agreed. It was pretty tough for me to get through. Ashli wrote it in a very gentle and sensitive way, but like any painful subject, it’s difficult to read. Especially aloud. I made it about halfway through before I lost it. Of course, my crying made her cry, so we both had a little cry together. We managed to get to the end, which was very happy. After all, HG is only for a little while. Then she wanted me to re-read it. Second time through was easier. I kept it together, and we both clapped together at the end. Since then, she’s wanted me to read it at naptimes and bedtimes. I asked her about the story. Does it make her feel happy or sad? She told me that this is a happy story. We talk about how Little Bunny and Mama Bunny feel. She lets me know that both feel sad and Little Bunny feels scared, but in the end, everything turns out okay. I make sure to emphasize how much Mama Bunny loves Little Bunny. Really, though, despite how sad or scared the bunnies feel, she always tells me that this is a happy story. I think that’s a huge win right there. Overall, this is a great book. It really validates the feelings a child might feel when Mama is sick: worry, anger, sadness, fear, feelings of rejection, etc. It validates those feelings, but it reassures that her Mama will get better and that her Mama loves her very, very much no matter what happens. If you’ve got a child and are facing another HG pregnancy, please do pick up a copy of this book. I am working my way through Beyond Morning Sickness now. After reading Ashli’s journal, I was afraid to read this book. Instead of finding it frightening, I’m finding it to be empowering. I’ll write more once I get through it, but it’s a very interesting read. Even for someone like me who hates reading non-fiction. My one caveat on this book, and it is a major caveat, is her section on termination and abortion. McCall’s pro-life stance is evident in this section and she makes multiple references to sources that have a political stance in opposition to a woman’s right to choose whether to carry a pregnancy to her. For many, this will be enough to render the rest of the book useless, which is why I find it unfortunate that she chose to present the information in this section in a slanted way. If you have questions about abortion/termination, I would encourage you to seek factual answers from groups like Planned Parenthood. Despite the major faults in the section on abortion, if you’re facing HG or if someone in your family is dealing with HG, I recommend reading Ashli’s books. In addition to being available through Amazon and Ashli’s website, you can purchase a copy through HelpHer.org with the proceeds going to help support HER Foundation research and education efforts. Do you have any books or journals that you found really helped you get ready for this? If so, please share. I’d love to add that info to my blog.